It's been a wonderful fête. I have enjoyed every minute and am looking forward to cattle prodding the judges into delivering their verdicts shortly. Before that, though, a couple of last minute entries. Firstly, this is called "Please Love Me". Its creator describes it as Meyer lemon, Persian cucumber and capers plus half a bottle of Pinot Grigio. 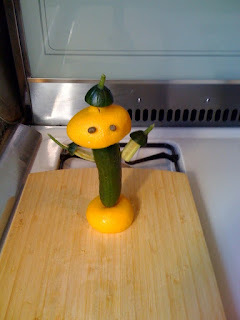 Ah, sweet, needy, exhibitionist vegetable sculpture. And then, the Fat Controller made me almost unbearably happy with the following scenes of model railway golden age of steam CARNAGE today. Now hang on, I have to get this right. 1. The Staplehurst derailment of 1865 (If you look carefully you might see a dazed Charles Dickens in the leading coach). 2. A representation of the untimely demise of the Rt. Hon. William Huskisson on 15th September 1830. The first ever fatal railway accident. 5. The incident known as 'Stephenson's Cow'. I have his assurance, readers of a nervous disposition, that no engines, troublesome trucks or animals were harmed in the making of these tableaux. The Fat Controller is a man of his word. I am entirely speechless after that. I am going to lie in a darkened room and fashion winners' rosettes out of endive leaves. weirdly Huskisson's was the first fatality, on the first day of the first passenger steam train running. He got squished. Bloody idiot. Why do I know things like this? Wow, that's a very useful engine. I am the artist on "Please love me" and have to clarify that it is NOT a Meyer lemon, just a regular old lemon from Trader Joe's. I don't think that affects the perception of neediness. And the meyer lemon thingy looks to be glowing from the bottom part. I kept looking for a lightbulb. I'm glad I'm not judging. Far too difficult.